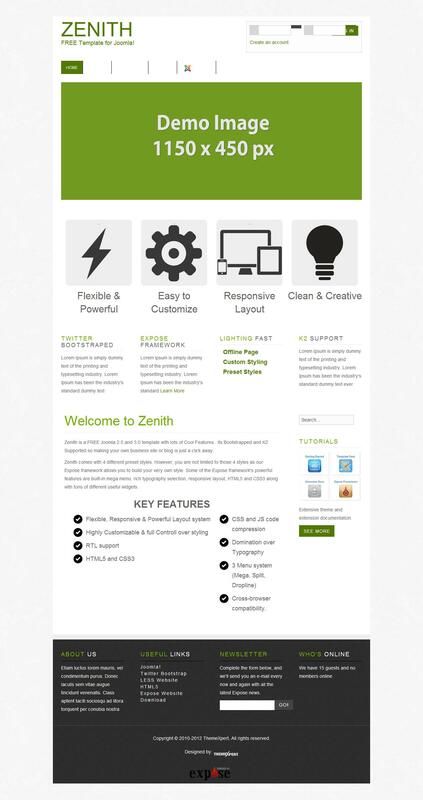 Zenith TX - nice pattern formed on a powerful framework Expose ThemeXpert from the studio and working for free. Template uniqueness lies in its flexibility. This feature it has received from the framework, which is based on TX Zenith pattern. Framework has all new basic functions needed for the formation of a good site to Joomla 2.5 or Joomla 3.0. Template options offer convenient control panel that allows you to quickly modify the style template completely external recognition. You can control multiple modules, changing the color palette every detail of design and fonts. Template supports mobile device management and activation RTL mode. In addition to the template TX Zenith built-known component K2.